The LMB houses about 150 postdocs at any one time, working in the 50 or so small groups that form the four divisions. While some have done their PhD at the LMB, most of the researchers have come from other labs worldwide, ensuring that we have a diverse research community. The different backgrounds also foster a collaborative environment: complementary expertise is readily shared in the community together with reagents and equipment. Postdocs usually work at the LMB for between one and three years, with limited possibility of extension. Postdocs who wish to explore coming to the LMB to work in a particular research area are encouraged to contact the group leader with whom they are interested in working to explore potential opportunities. Many postdocs at the LMB obtain their own funding after developing a project with a group leader. The University of Cambridge maintains a comprehensive list of non-industrial funding opportunities, which can be searched by the sponsor, type of scheme, date and application stage. In addition to this self-funded route, there are some LMB-funded positions which become available from time to time. In particular, LMB International Fellowships have been created for the development of innovative research, and candidates for these Fellowships would be expected to introduce new scientific projects or expertise into the LMB. All LMB-funded positions are advertised in major journals such as Nature and Science, and can also be found directly on the Current Vacancies page of this website. We also encourage potential recruits to view individual Group Leader pages and to contact them directly regarding possible positions in their labs in the absence of formal advertising. Because of the relatively small number of PhD students, and because the LMB is not a department of the University of Cambridge, postdocs usually have few or no academic duties. Nevertheless, a number of researchers are also affiliated to a Cambridge University college and can participate in teaching. Administrative responsibilities are kept to a minimum, helping to keep research the foremost priority. Postdocs also enjoy considerably more autonomy than commonly found in other institutes, providing a good platform for subsequent career steps. I have been a postdoc at the LMB for three years. Originally from Hungary, I completed much of my education in the USA before moving to the UK to earn a PhD at the University of Cambridge, studying autophagy and neurodegeneration. 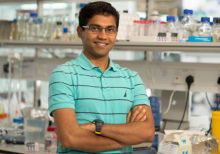 In my postdoctoral fellowship at the LMB, I have been working in the Cell Biology Division with Ramanujan Hegde, investigating mechanisms of protein quality control. Starting this project involved many changes, both in terms of research topic as well as experimental techniques, but the LMB provided a terrific environment for such a transition. The institute is full of incredibly intelligent, curious, and motivated people who are happy to share their expertise. Bolstered by capable and knowledgeable support staff and no shortage of resources, I have always felt a great deal of freedom to try new ideas and learn whatever was necessary to approach my research question. Scientists working here represent many diverse interests, which is reflected by the wide range of interesting seminars from both internal and external speakers. Conversations with colleagues in other groups is an excellent source of insight and often provides me with a new lens through which to view my own work. Although postdocs at the LMB certainly work hard, we still take time to have fun and socialise, through regular happy hours, barbeques, pub nights, board game nights, or just chatting over tea and cake in the canteen. I believe the past few years have had an immense impact on shaping who I am as a scientist, and looking back, I am very glad I chose to spend them at the LMB. Eighteen months in, I find that the LMB has successfully managed to retain this distinguishing feature nearly three decades later. Although the constant influx of driven students and postdocs, brilliant, well-funded group leaders, and an efficient support network are perhaps the main reasons for the LMB’s success, the collegial environment is why I know I chose well. I perform cryo-EM studies of the ribosome and its regulation by cells in Venki Ramakrishnan’s group. 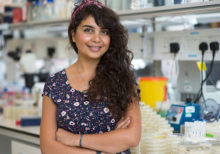 I benefit from daily interactions with members within our group, others in the Structural Studies Division as well as with Ramanujan Hegde and his group in the Cell Biology Division. This support network is especially important for me since I hadn’t worked on either cryo-EM or protein translation as a graduate student. Members of the cryo-EM facility deserve a special mention for their round-the-clock efforts to train users like me and maintain the microscopes. Expectations are obviously high, and postdocs are expected to work independently but I nevertheless find myself able to settle on a work-life balance that suits me. Outside of work, I play cricket for the LMB team (now called Molecular Biology and which Fred Sanger used to captain once upon a time) as well as another local club. I also occasionally enjoy socializing at college formal dinners, which remind me of mealtimes at J.K. Rowling’s Hogwarts School of Witchcraft and Wizardry. As I neared completion of my PhD in Chemistry & Chemical Biology at the University of California San Francisco, I searched for a postdoc position to continue my development and journey as a research scientist. My criteria included a strong culture of innovation, creativity, and collaboration, with excellent resources and infrastructure. Growing up in a small rural town in Oregon, USA, I was always drawn to opportunities to grow my global experiences and perspective, so when an opening arose to visit Europe for a science conference I extended my stay to visit research groups and give seminars in several countries. The renowned European research institutes and groups I visited created a tough choice, but in the end, I chose the LMB and to join Jason Chin’s group due to its ambitious and innovative approaches to tackling challenging questions and engineering problems in molecular and cell biology. During my visit to the LMB and the Chin lab, I was very impressed by the collaboration and creativity demonstrated by scientists both within the lab and across the institute. At first the LMB can feel a bit intimidating, but once I settled into the lab, I was pleased to find a friendly supportive community sharing a dedication and passion for pursuing scientific discoveries. Being a member of the LMB research team gives me access to numerous support systems that facilitate the progress of my research projects, through central stocking, ordering, dishwashing and media kitchen services, to dedicated technical staff that support the various high-end instrumentation. My research project is co-funded by AstraZeneca and as a result I have the opportunity to regularly discuss aspects of the project with my industrial partners. It is exciting to gain perspective into the research priorities, approaches, and systems available in an industrial research environment. In addition to my research, I have had the opportunity to engage with the Cambridge community through volunteering with numerous public engagement activities organised through the LMB, most recently the Cambridge Science Festival and the LMB Open Day. 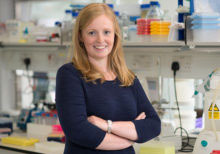 In addition, I have taken advantage of opportunities to connect with postdocs across the University, through the Cambridge Postdoc Society (PDOC), Entrepreneurial Postdocs of Cambridge (EPOC), and through postdoc affiliations with the Colleges, where I am a Postdoctoral Research Associate at Darwin College. Many professional colleagues initially questioned why I wanted to move across the ocean for my postdoc. I feel strongly that the scientific enterprise is a universal pursuit and as a result, the largest advancements in our scientific knowledge will arise through international engagement and collaboration. The culture, resources, and calibre of research make the LMB the ideal place for such research to thrive and for me to fulfill my goals. I have been an MRC Career Development Fellow since March 2015 working with Rebecca Taylor. 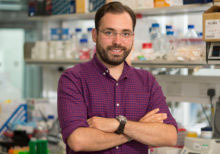 We are focused on investigating the inter-tissue stress response signalling, particularly in the endoplasmic reticulum (UPRER) and the influence of this stress response on neurodegenerative diseases such as Alzheimer’s disease and Huntington’s disease using the nematode model organism Caenorhabditis elegans. Being in the LMB is eccentric and prestigious. Since my first day I have felt that I should grasp every opportunity to challenge myself and to stretch my potential. Walking down the same hallways as several Nobel laureates and seeing the handwriting of Sydney Brenner on the wall have made me feel even more privileged to do science. After completing my undergraduate degree in Cell & Molecular Biology in Iran, I moved to England to further my education. I started my graduate studies in Biomedical & Molecular Sciences at King’s College London (KCL). I was the only one on my course of study who had never held a Gilson pipette in their hands! However, I did not let that hold me back – I quickly caught up and managed to secure a PhD scholarship at KCL. When I finished my PhD in Genetics, I wanted to explore more diverse topics and I was delighted to receive a job offer to become a postdoc at the LMB. It is different being a postdoc here compared to anywhere else. Funding opportunities and equipment are never an issue; time and personal ATP levels are the bigger problems! There are so many opportunities to discuss, and to have formal and informal scientific chats with other scientists, especially during the famous LMB 4pm cake time. Everyone is very friendly and helpful, and I am so grateful to be surrounded by fantastic scientists, irreplaceable support staff and a high quality environment to work in. The bar is very high and we all aim to do our best and to be the best. I have never second-guessed my choice to come to the LMB. This place breathes science.